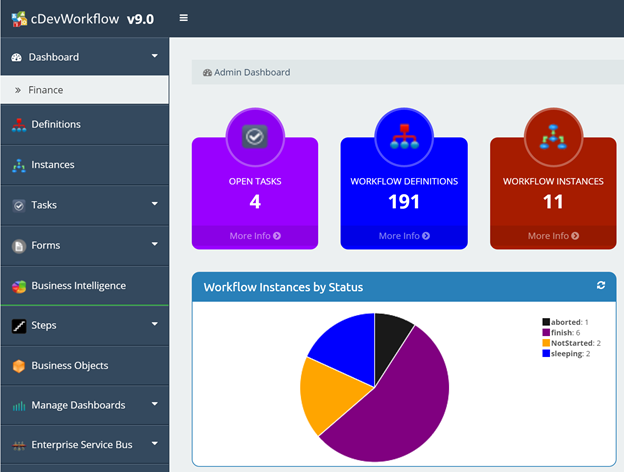 cDevWorkflow v9.0 is a major release with lots of new features and enhancements to better serve our users. Here is a high level overview of those enhancements! The new dashboard feature is a big deal. Users now are able to have multiple dashboards based on different layouts and comprised of different dashboard widgets. And, cDevWorkflow now provides new capaibilities for managing dashboards, layouts and widgets. Users may now have any number of custom dashboards, for example, one showing information about sales and yet another about finance. Version 9.0 provides a complete graphical layout designer for designing dashboard layouts, and it includes 37 widgets that provide graphical cDevWorkflow statistical information. In addition, you have the power to implement your own custom widgets that can be rendered within the dashboard user interface. cDevWorkflow version 9.0 now supports event archiving. Users configure archiving using the event configuration settings: cDevWorkflow’s archival engine will move all processed events, and events with errors, into specific archival tables to improve performance for the event engine. cDevWorkflow engine services now use child processes to process requests that are waiting to be processed by each of the engines. This guarantees, that if the engine service fails, it does not stop all requests being processed. Based on the amount of work to be performed by each engine, each engine service will spawn child processes to perform the requested work. Configuration settings within cDevWorkflow allows Administrative users to configure the # of child processes to spawn at any given time. # of child processes to spawn should be configured based on the hardware resources its running on. Each of the engine services also uses intelligence on how to throttle the processes based on load. cDevWorkflow version 9.0 now lets you control the priority of sub-workflows separately from parent workflows. By default, the sub-workflow process will inherit the process execution priority from the parent process, but now sub-workflow processes can be also configured with execution priorities different from parent process, so that, for example, parent processes can execute at a high priority and child processes can execute at a lower priority. cDevWorkflow uses a virtual workflow user concept that permits mapping to real users from external applications. Now, cDevWorkflow offers user connectors and synchronization services to connect and synchronize with directory services. cDevWorkflow now provides connectors for Active Directory, LDAP and OLE DB database synchronization. Once a synchronization scheme is configured, users can be manually synchronized or automatically synchronized. As Workflow Instances, Form Instances and Events get generated in production systems, databases can grow to unwieldy sizes. Even with archiving, performance improves but data keeps growing. At some point, perhaps even archived data becomes surplus and needs to be cleaned out. cDevWorkflow now provides users the ability to schedule or execute manual data cleanup of archived data. cDevWorkflow engine execution may generate much data for users. Some, such as execution error log items may become data that take up space that users want to reclaim periodically. Now, cDevWorkflow has a configuration setting to clear this data either manually or automatically. cDevWorkflow now offers more options about how dates are displayed and processed by the Configuration Manager User Interface. Using the culture setting and the language used by the database connection, dates generated and displayed are automatically adjusted. Users may now use US, European, Asian date formats simply by using the desired culture setting. In order to make the configuration of culture setting simple, the Status->Culture UI now lets you select any of the many cultures supported by Microsoft. License information – with a single click now you can send the license key or the license file through email to cDevWorkflow support team. Just as we provide examples of the new Dashboard functionality, version 9.0 includes 4 new code samples to provide insight on how to implement dashboard widgets. These are fully documented code samples on how to build and implement dashboard widgets. cDevWorkflow v9 packs even more functionality into the product than past versions – a trend we will continue!